Chelsea lost further ground on leaders Manchester United as Carlos Bocanegra struck a late leveller for Fulham in an entertaining game at Stamford Bridge. Moriz Volz put the visitors ahead when he stole into the box and lashed in the Premiership's 15,000th goal. Frank Lampard levelled when his 20-yard drive was deflected into the bottom corner by Fulham's Liam Rosenior. 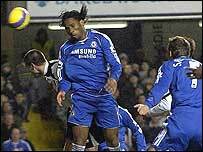 Didier Drogba headed in Lampard's cross to make it 2-1 but Bocanegra slotted home late on to earn Fulham a point. It was just desserts for the visitors who had more than played their part in a fascinating encounter in at times torrential weather conditions in west London. But it all looked so unlikely at the start as Chelsea began brightly. They could have been 2-0 up inside the first five minutes, Salomon Kalou crossing for Michael Essien to poke wide and then Essien returning the favour only for Kalou to fail to make contact six yards out. Kalou was causing all sorts of problems down the Chelsea left and Rosenior was struggling to cope with his electric pace and dribbling ability. Yet without the formidable John Terry, the Blues at present always look likely to concede and against the run of play, they fell behind. A long throw from the left from Franck Queudrue was missed by every Chelsea player and Volz had time to take a touch and rifle it in from eight yards, via the right leg of Paolo Ferreira. In an instant Volz wrote his name into the Premiership history books and he will have £15,000 from league sponsors Barclays to donate to a charity of his choice. Yet it was Chelsea who were in a charitable mood and it should have been 2-0 when Wayne Routledge blazed over from 12 yards after more ponderous defending from the champions. Fulham could barely believe the freedom they were being allowed, but the Stamford Bridge faithful need not have worried as normal order was soon restored. A hopeful punt into the box from Claude Makelele was weakly headed away by Rosenior and as Lampard drove it goalwards with interest from 20 yards the ball ricocheted off the Fulham defender and into the net. If the visitors felt hard done by with the manner of the equaliser they did not show it and they burst out of the blocks in the second half. McBride was foiled by a Hilario save and the American then crossed for Collins John who was inches away from making contact. But as the heavens opened, Chelsea found that extra piece of quality they needed to go in front. Ashley Cole's long cross was not properly cleared and Lampard turned neatly on the left-hand edge of the six-yard box to cross for Drogba to comfortably head home. To coin a cliche, the rain was continuing to prove a real leveller and Fulham to their credit always looked capable of getting back on level terms. Their perseverance was rewarded six minutes from time when Ballack failed to clear Queudrue's cross, Hilario saved McBride's effort with his right foot and Bocanegra was on hand to slot in. The point moves Fulham up to 11th, but more importantly Chelsea go into the new year six points behind United at the top. "I must credit Fulham and the way they reacted. They know we can't defend so they attacked, it's that simple. "The story is the same for us. When teams keep seeing us making mistakes they believe they can score goals. "At the moment we are always in danger. We've conceded two goals four times in-a-row and it doesn't surprise me." "It's a massive point for us and I thought our overall performance was magnificent. We can't ask for more from this current crop of players. "We knew the longer the game went on and we weren't out of it we'd have a great chance to get something here. "We played a lot of good football in the second half and made chances too." Chelsea: Hilario, Geremi (Shevchenko 57), Ferreira, Carvalho, Ashley Cole, Essien, Ballack, Makelele (Wright-Phillips 86), Lampard, Drogba, Kalou (Bridge 80). Subs Not Used: Hedman, Morais. Goals: Rosenior 35 og, Drogba 62. Fulham: Niemi, Rosenior, Christanval, Bocanegra, Queudrue, Routledge, Volz, Brown, Radzinski, McBride, John (Boa Morte 68). Subs Not Used: Batista, Runstrom, Zakuani, Omozusi. Goals: Volz 16, Bocanegra 84.